so said ellie: The lady bakes. Today I've been at home in bed with a particularly nasty case of tonsillitis, nasty as in, can't swallow or move my head from side to side because my throat is so swollen. Yuck. Reminds me of the time I had chlam....anyway. Step 1. The marzipan. While I don't especially like the taste of marzipan, it's often used as the first layer to hide the taste of the fondant on top. 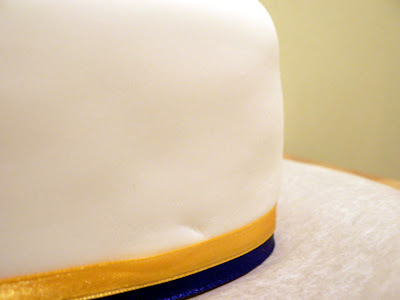 It also helps to seal the cake to stop it going bad while you work on it. Step 2. Crumbing. 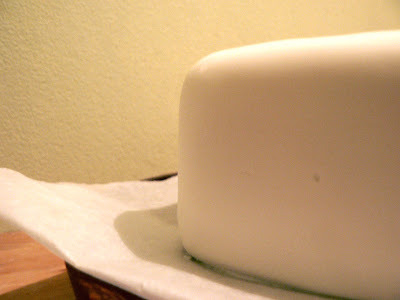 Use the marzipan to plug up any holes in the cake which might prevent a smooth surface on the fondant layer. Step 3. Covering. 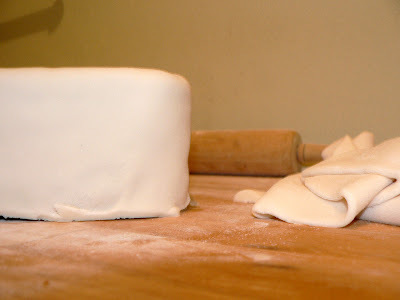 Some books recommend you lift the marzipan/fondant on the cake with the help of your rolling pin but I find it just as easy to quickly lift it on. 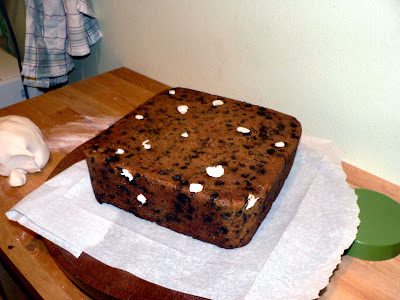 It's very important to paint the cake itself in sugar syrup first so that the marzipan is anchored to the cake. Step 4. Trimming. I find that this is a good time to level up the bottom of the cake by sticking a little of the excess marzipan underneath. Step 5. The fondant. 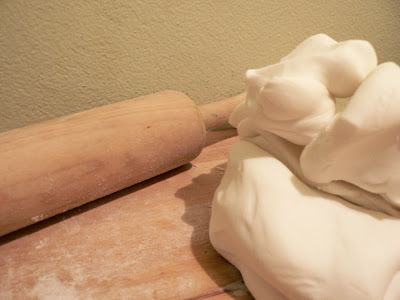 You absolutely have to make sure that the fondant is well kneaded before you start to work with it. Also, it has to be quite thick, about the width of a pencil. For this cake I probably used about 700g. Step 6. Covering, smoothing and trimming. Do this just as with the marzipan. 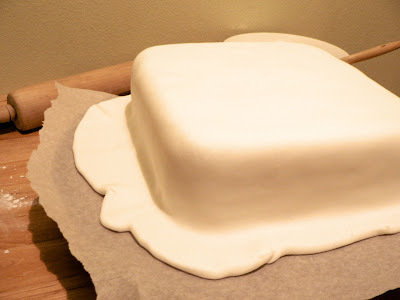 You also need to paint the marzipan with sugar syrup before putting on the fondant but you need to be careful not to get any on the outside surface. 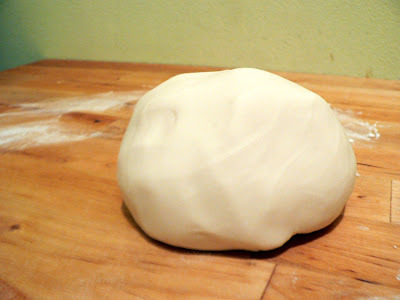 When you smooth the fondant you should try only to use the palms of your hands, avoid touching it with your fingers. Step 7. Ready to decorate! 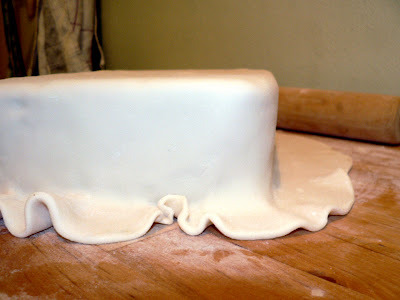 Actually, it's probably best to leave it for 24hr to let the fondant harden up first. And that's how it's done! I need to finish the decorating soon and send it back to Grafton, so I'll post pics of the finished product soon.